I have been crocheting chain stitch scarves lately and came up with this stitch variation. On my chain stitch scarves, I change yarn colors every other row and just carry the yarn at the end of that row. I drop and pick up the new color after I crochet two rows. On the first row of the new color, I do a single crochet spike stitch or long crochet stitch down into the first row of the prior new color. 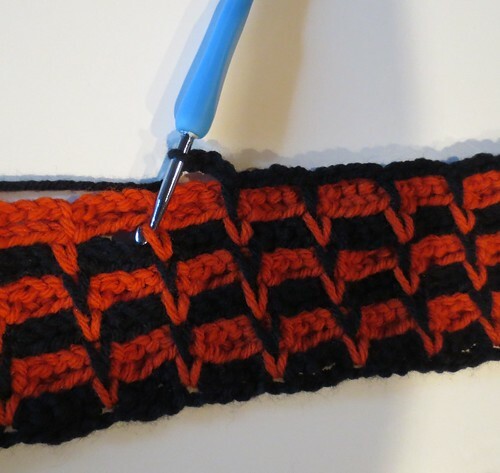 By working this long single crochet stitch, it creates a unique V stitch look to the scarf. 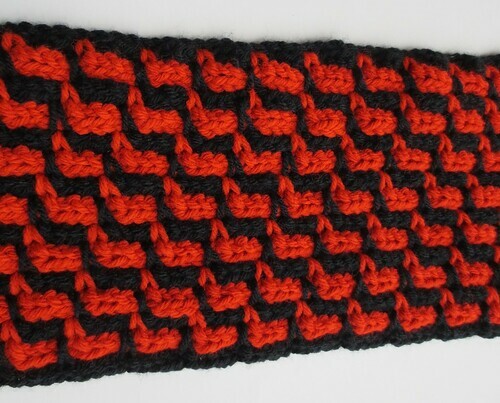 Here is a closeup of one scarf I crocheted using the stitch design. 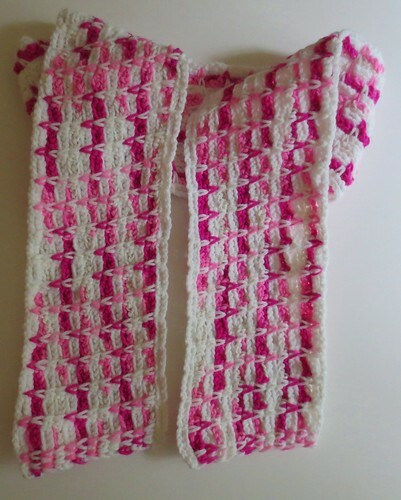 Here is a pink and white youth sized scarf I crocheted using the same chain stitch design. For the youth size, I crocheted a starting chain of 5 feet. Chain 7+ feet to start scarf. 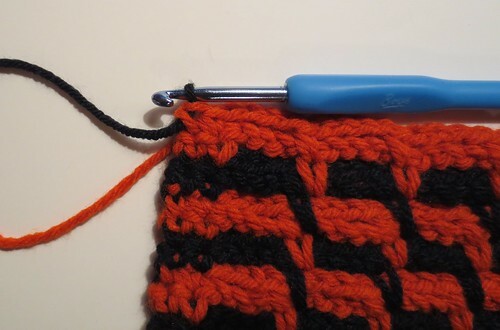 Don’t worry about stitch count as you can always just unravel any unused stitches of the base row you don’t need. Pull up new color in last stitch of row 2, ch 1 and turn. Work spike stitch (long SC stitch) into the first two stitches of row 1 (prior color.) Chain 4 and skip over chain space and work a spike stitch into the center of next SC stitch from row 1 and just keep repeating between * until the last two stitches of row. Work a spike stitch into the last two stitches of row. (Make sure you go down into the row 1 SC of the prior color so you have a long SC to match other long SC along the row. See photo below to help. Closeup of start of spike stitch with new color into stitch below. Ch 1 and turn. Work SC into the next 2 stitches of row, *chain 4 and skip chain space and work a SC into the next SC* of row 3. Repeat between * until end of row, work a SC in each of the last two stitches of row. Change color on last st of row by dropping old color and picking up the new color on last loop of last stitch. You just leave the old color at end of row and pick it back up when you return to the end this row again. Tip: All SC’s for this row are regular and not long (spike) SC’s. Only the first row of each new color are spike SC’s. The second row of each color is worked with regular SC’s. You will have two SC stitches at the end of each row. Chain 4 and skip over chain space and work a spike stitch into the center of next SC stitch from 2 rows down and just keep repeating between * until the last two stitches of row. Work a spike stitch into the last two stitches of row. Repeat row 4 and 5 until desired width is obtained. Make sure your final row is regular SC’s as in row 4 to finish scarf. You want to have two rows of each color when you finish off scarf. I finished off my scarves using the same color as the first 2 rows. 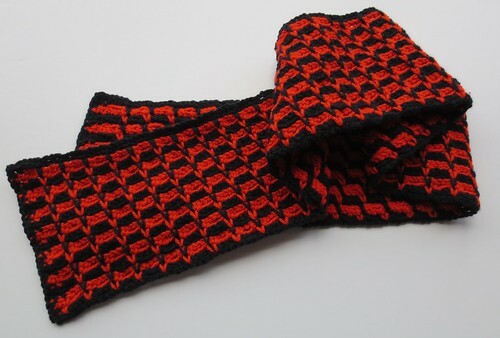 30 rows has a finished size of 6-1/2 inches wide as in the black and orange scarf. 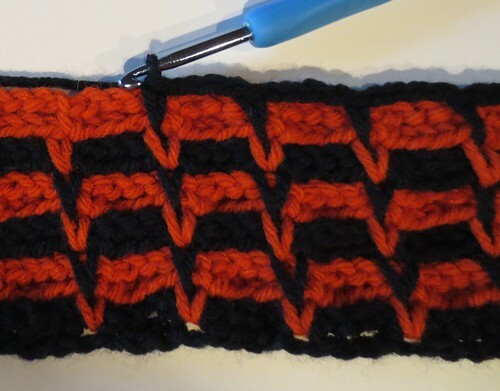 The front of the scarf has all the spike stitches lined up. 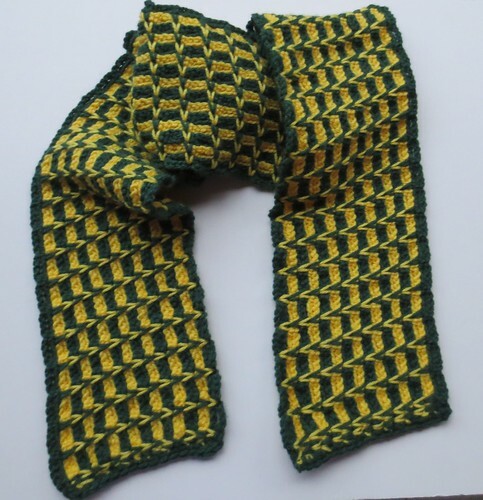 The back of the scarf has a different look with the stitches creating the design below. Work a row of SC along the ends of the scarf if desired. The black and orange scarf has this trim. Question about the pattern, in row 2 you chain 4 but only skip 3 chains before making a sc, is that a typo, should the chain and the number of stitches skipped be the same? @Doug – Yes chain 4 and skip over 3 chains which means you will be working the SC into the 4th stitch. It all works out and is not a typo. Let me know how yours turns out. I’d love to see your scarf. How simple and cute!I very very Like and love It. I’d love to share an image and link to your Spike Chain Stitch Scarf in a roundup of patterns for Wear Red Day, an event in the United States to help promote awareness of women’s heart disease. If I have permission to include your photo in the roundup image, please let me know. Thank you. Best wishes and thanks so much for asking.